-Is designed for light industrial use. Attach signs, tags, place cards to warehouse racks and skids. -Hand dispensed rolls - no dispensers needed. -Use instead of double-sided tape, paste and glue. -Clear acrylic adhesive with tan paper liner. -3M™ Adhesive 400 is a medium-firm acrylic pressure-sensitive adhesive system with an excellent balance of high initial adhesion (quick stick) and good shear holding power. -Bond strength is dependent upon the amount of adhesive-to-surface contact developed.Firm application pressure helps develop better adhesive contact and improve bond strength. 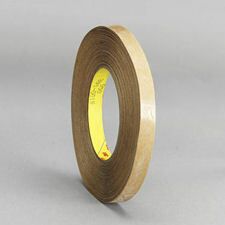 -Ideal tape application temperature range is 70°F to 100°F (21°C to 38°C). -Initial tape application to surfaces at temperatures below 50°F (10°C) is not recommended because the adhesive becomes too firm to adhere readily. However, once properly applied,low temperature holding is generally satisfactory. -Use for light industrial application mounting or attaching papers and plastics. -High-speed flying splices on most grades of paper. -Splicing of foils, films, fabrics. -Laminating adhesive for foams, photos. -Attaching metal or plastic nameplates.